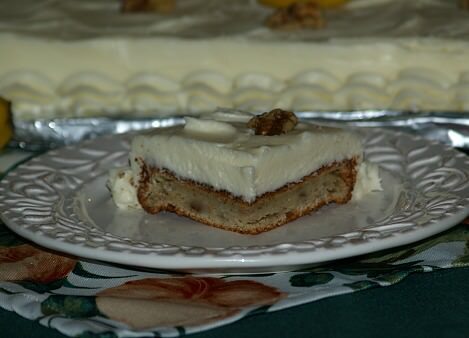 Desserts for a crowd are an essential part of any get together whether it is a simple cook out or an elaborate party. Sometimes you can get by without appetizers but most crowds look for a “grand finale” at the end of the meal or a “sweet bite” at a simple gathering. Whether you are having a family gathering, a gathering of close friends, a church supper or an office party, do not forget the dessert. The dessert serves as the finale for guests to give their stamp of approval and this is what usually remains in the memory after they leave your gathering. Desserts for a crowd are a hit with almost everyone; it is a big disappointment when none is provided by the hostess. The second biggest disappointment happens when there is not enough to go around for seconds. I have been to parties when the pieces are so tiny that you can’t even taste it. (I am OK with small servings as long as there are more servings.) They can be as simple as cake recipes and cupcake recipes which are the most common and easiest to decorate for special parties and events. These can be made in different flavors for different seasons and events AND most can be made in advance which is always a plus. Fresh baked pies are easy to make and very popular desserts for a crowd; especially at church suppers and many potluck dinners. Many pie recipes like the fruits can be made ahead and stored in the freezer either already baked or unbaked. Fruit cobbler and fruit crisps are also recipes to please your dinners; they can be made ahead of time which is also a “pleaser” for you. Do not overlook cookies and bars when making desserts for a crowd. Ones like the 7 layer bars recipe makes a luscious dessert and is easy to prepare ahead. One dessert that I was introduced to in the French restaurant was the cream puff recipe. These little gems came in from the commissary filled with cream and drizzled with a delicious blueberry sauce they are perfect desserts for a crowd. One day a few were smashed when they came in so I had the chance to sample them. Oh, how delicious! Years later when I worked at the country club, the cream puffs became the favorite of desserts for a crowd for most parties. I have made hundreds of these; after baking, when they were cold I would put them in large plastic bags and place them in the freezer. When the party date arrived, they were so easy to fill with cream or custard. (These can also be filled with salad mixtures and served as appetizers) Right before serving I would drizzle some type of berry sauce (blueberry or raspberry) over them and garnish with a little whipped cream and a couple of fresh berries. They were a hit every time! 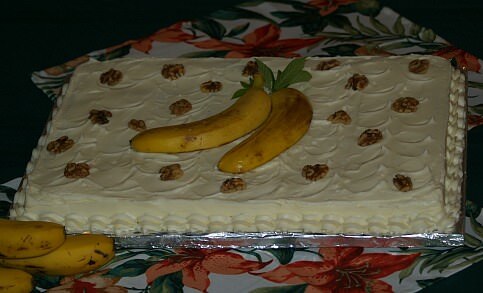 This really is the best banana cake recipe suitable for any gathering when you want a dessert for a crowd. It is said to have been Elvis’ favorite cake and I can see why. The amount of cream cheese in this recipe makes it delicious especially in the topping. 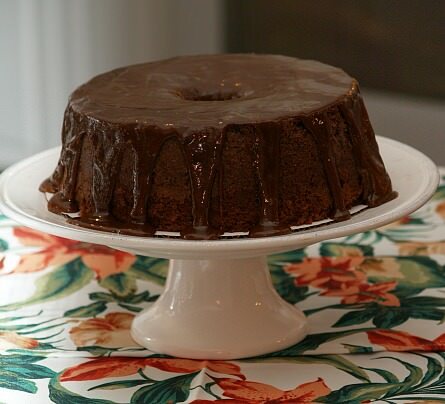 I have made it as an 8 inch layer cake, baked in a 9 X 13 inch cake pan, baked in a Bundt cake pan and I have even made the most delicious cupcakes with the batter. You could get 12 to 15 servings but it is so good I would allow less per cake and maybe bake 2 if I necessary. (That’s me; I love good cake!) However you make it, they make great desserts for a crowd. NOTE: I doubled this recipe and baked it in a 12X18 inch pan which would give me 54 to 60 servings. See my picture and the recipe I used below the regular recipe. It turned our delicious and beautiful! Preheat oven at 350F degrees; grease and flour chosen pan or pans or paper cupcake liners. Beat cream cheese until smooth; add milk, sugar and butter and beat until well blended. Blend in eggs and bananas; combine and sift flour, baking powder and baking soda. Stir nuts into flour mixture; stir dry ingredients into creamed mixture just until blended. Pour batter into prepared pan, pans or cupcake liners. Bake until pick comes out clean: about 60 minutes for Bundt pan; 45 minutes for 9 X 13 inch pan; 30 minutes for layer cakes; 12 to 15 minutes for cupcakes. Cool completely and frost with cream cheese frosting; I double frosting recipe for a layer cake. Combine all ingredients; beat with mixer until whipped and creamy. This is one of my favorite desserts for a crowd because you serve it in tiny pieces. This will be easier to eat when standing. It is important when deciding on desserts for a crowd if they will be standing or sitting. USE SAME DIRECTIONS AS ABOVE except I used a 12X18 inch baking pan baking 60 minutes at 350F degrees. I wanted to remove the cake from the pan to frost so I greased, lined with parchment paper and then greased again and floured. Because I wanted to frost the sides and top I made a triple recipe of frosting (Recipe below). It does not take as much frosting just for the top if you leave it in the pan to serve. CREAM CHEESE FROSTING for banana cake that I used. Beat until creamy and smooth to spread. 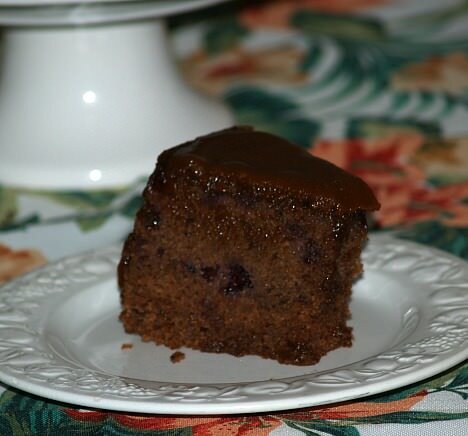 This is one of the recipes for desserts for a crowd which I have made in a smaller version many times over the years. It is always very good. If you refrigerate this desserts for a crowd it is easier to slice it very thinly for many servings. It is a dense and rich dessert so a small serving is best. Grease heavily and flour a tube baking pan. Cream butter and sugar; add eggs beating after each addition. Sift flour, cinnamon, nutmeg and allspice together. Toss berries with 3 tablespoons of flour mixture and set aside. Mix baking soda with buttermilk and add alternately with flour mixture to creamed mixture. Mix in jam and whiskey blending well; stir in flour coated berries. Pour into prepared pan and bake for 2 hours; cool 10 minutes and remove from pan. Let set until cold and ice with brown sugar frosting. Serves 16 to 20. Combine milk and sugar and bring to a boil; add baking soda and butter. Cook to a soft ball stage (235F degrees); add vanilla and beat until cool. I found it best to make one recipe at a time. But these are great desserts for a crowd since the recipe is easy to make. Each makes about 14 puffs. Make several recipes and freeze them. Remember you will want some extras to sample! Heat butter and water to a rolling boil; stir in the flour. Stir vigorously over low heat for about 1 minute or until mixture forms a ball. Remove from heat; beat in eggs one at a time and continue beating until smooth. Using a pastry bag with a wide tip, drop dough (about ¼ cup each) 3 inches apart on ungreased baking sheet. Bake 35 to 40 minutes or until puffed and golden brown. Fill with cream or custard; dust with powdered sugar or top with fruit sauce. This is the custard filling recipe I use for cream puffs recipe. Even though I make one recipe of the cream puffs at a time, I have made two recipes of the filling at a time with no problems. Mix together flour, ½ cup sugar and salt; scald milk and add to the flour mixture while stirring. Cook mixture until thick and smooth. Beat egg yolks; stir a little of the hot mixture into the yolks and then pour it back into the pan with remaining hot milk mixture. Cook 2 minutes stirring constantly; remove from heat and stir in butter and vanilla and let cool. Beat egg whites until stiff gradually beating in the 6 tablespoons sugar. Fold egg whites into cooled pudding; refrigerate until cold and fill puffs. This sinfully delicious cookie bar makes a perfect dessert for a crowd. Place butter in 9 X 13 inch baking pan and melt in oven 5 minutes. Layer graham cracker crumbs and then semi sweet chocolate chips over the butter. Next layer butterscotch morsels and then coconut over chocolate chips. Pour sweetened condensed milk over the coconut layer. Top with pecans; bake for 30 minutes. Preheat oven to 350F degrees; butter two pans. Combine all cans of pineapple flour, sugar and cheese; spoon into greased pans. Combine crumbs and butter; sprinkle mixture evenly over casseroles.